Of the printers listed below, do you sell any inks that are compatible with any of these 4? Thank you for your question, unfortunately we do not guarantee that any cartridges which are put in printers bought outside of the UK will work. Unfortunately this would invalidate your guarantee with us, I am sorry that I am unable to help you with this any further. Thank you for your question, unfortunately we do not ship outside of the UK. what cartridges can I use for a canon pixma mg3051 . Dear Edward, thank you for your question. The cartridges you require for your Canon Pixma MG3051 are Black & Tri-Colour Canon PG-545XL & CL-546XL. You can find these via the link below; https://www.cartridgesave.co.uk/ink-cartridges/Canon/Pixma-MG3051.html. Does the printer come with ink cartridges? Are there 3 separate colour cartridges or is it 1 cartridge? Thanks. Hi Tilly, thank you for your question. When the printer is purchased it will usually come with starter cartridges included. The Tri-Colour cartridge consists of Cyan, Magenta and Yellow inks all within one cartridge. I hope this helps. A low budget feature packed printer that begs to be hidden away, but with a number of wireless solutions, at least you can print from another room. The Canon Pixma MG3050 range of printers are a pretty uninspiring boxy setup, although a number of colours are available. Built on a budget, the MG-3050 has no display, just a series of buttons and LEDs to inform you. Although navigation at the printer is limited, WiFi and cloud print are supported so a plethora of devices can be used to send images. Canon Pixma MG3050 ink cartridges are widely available in retail and value packaging making it simple to locate fresh cartridges. High yield XL cartridges are always available for improved cost per page. Cloud printing from services such as OneDrive, Evernote, Dropbox and Google Drive are supported allowing you print directly from a smartphone or tablet. 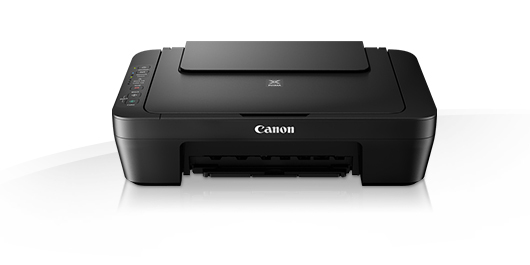 Wireless PictBridge support also allows you to print directly to the Canon MG3050 from cameras with this facility. An uninspiring design lets the Canon MG-3050 down. It’s dimensions are also larger than some of the competition, so finding a home for it may be difficult.